When Christians experience pain and "bad things" in life, often they automatically attribute it to the devil. The truth is that the devil can't do anything to a Christian without God's allowing it. Read Job. We sing about the "refiner's fire" and it's oh so spiritual, but what we are really singing is about the fact that those who would truly follow God and cooperate with the work of the Holy Spirit in their lives will go through MUCH difficulty to the purpose of "refining", purifying us in the process of conforming ourselves to the model of Christ. The process of being in God's refining fire doesn't automatically purify us, but affords us opportunities to see the truth of ourselves and gives us the opportunity to choose to remove those impurities from our lives. Remember, He created us to be free will creatures. We don't loose that right to choose when we give our lives to Him. Every moment of every day we are to consciously "choose" His way, His truth, His service. When we are in difficult situations, parts of our personality become noticeable that we might not have realized were there (or still there)...hence, the necessity for His refining fire. As we see that imperfection, we then have the ability to choose to remove it from our lives, and He will help. Without the fire creating a situation where we could see that impurity in our lives, we'd have gone along thinking we were just fine, when in truth, we still have a lot in common with the "white washed seplecure" He spoke of. It is out of love for us, to aid us on our path to spiritual maturity that God affords us these many opportunities for us to see ourselves by letting us gaze into that pot of gold with all the dross risen to the top so we can see our true condition and make choices. He will help us carry out those choices, if we choose rightly. The goal is to one day look into that pot of gold that's in His fire and see His face reflected in it's mirror surface, after all the dross of our impurities have been removed. Of course, not one of us will reach that till we are caught up in the air, changed in the twinkling of an eye to be just like Him and then, ever more we will be with Him! Hallelujah!!! It's a process - a journey with our hands tightly in His. So let's not miss God's loving plans for our good by automatically blaming the devil for every unpleasant thing that comes our way! Let's not miss the blessing God means to bring from each situation! 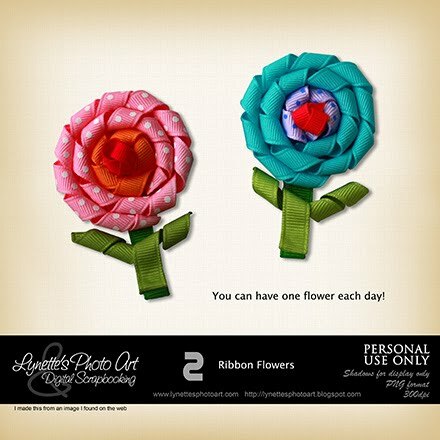 Yesterday I gave you one of these fabulous Ribbon Flowers I made from an image I found on the web and today you can have the other one - enjoy! the flowers are soo cute, thanks! Love these ribbon creations, thank you! oh thank you for this flowers and it's fabulous to share the love of Jesus, God bless you! !